Did you guess this weeks CAN YOU NAME THIS CREATURE? It is a PEACOCK SPIDER!! Well done to Michael from Nature Learn and to Sonja Koprek for getting it right! What is not apparent from the photo above is the size of these spiders, they are tiny, growing to no bigger than 5mm! It is only the males that have this splendidly coloured stomach flap… the females are brown in colour with black markings. When the male spots a female it raises it’s legs and flashes it’s brightly coloured flap in an unusual dance like sequence…. a spectacular mating ritual!There are about 20 know species of peacock spiders but less than half of them have been formally identified! 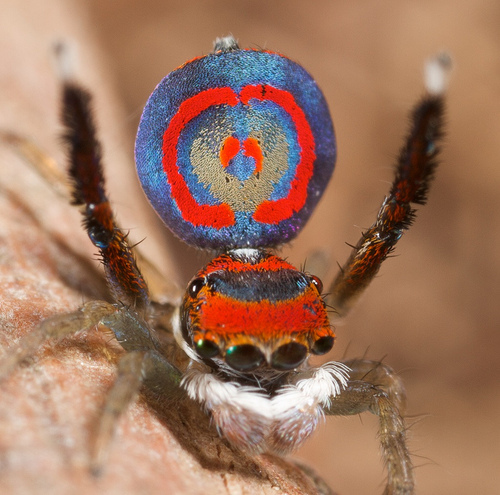 This one is the Coastal Peacock spider (Maratus specious). Peacock spiders are found in south eastern Australia they are also know as gliding spiders and are a type of jumping spider.